Three hundred years ago, fate bound Prosper Redding and Prince Alastor of the Third Realm together. Now the human boy and fiend heir to the demon kingdom must put aside a centuries-old blood feud to save everything they love. Alastor will guide Prosper through the demon realm-under one huge condition: Prosper must enter into a contract with the malefactor residing in him, promising eternal servitude in the afterlife. With Prosper's sister in the clutches of the evil queen Pyra, Prosper has no choice but to agree. But when they arrive in Alastor's deliciously demonic home, the realm is almost as alien to Alastor as it is to Prosper-the lowest fiends have dethroned the ruling malefactors, while an unfathomable force called the Void is swiftly consuming the realm. The desperate fiends cling to the one person who says she can stop it: Pyra. 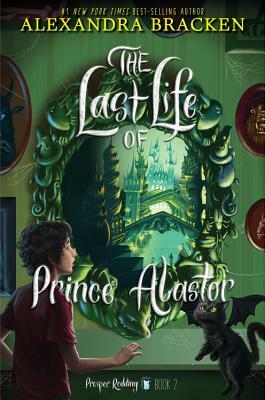 As Prosper embarks on a perilous rescue mission to the Tower of No Return, he can't help but feel for the demons losing their home-even Alastor, who lives by a set of rules that have vanished in a new world. With the fates of humans and demons at odds, the battle lines are drawn. Long ago, Prosper's ancestor Honor Redding proved that humans and demons could never be friends. But is Prosper like his ancestor? And is Alastor the same demon who was betrayed by the one human he cared for? Alexandra Bracken is the #1 New York Times and USA Todays best-selling author of the Passenger series and the Darkest Minds series. Born and raised in Arizona, she moved east to study history and English at the College of William & Mary in Virginia. After working in publishing for several years, Alex now writes full-time and can be found hard at work on her next novel in a charming little home that's perpetually overflowing with books. Visit her online at www.alexandrabracken.com and on Twitter @alexbracken.